It’s playoff time again, which means it’s also time for our Breaking It Down series. That’s where I – and I alone – take a look at the post-season matchups and provide is a snapshot of the action to come. This edition features a look at the Western Conference bout between the Los Angeles Kings and San Jose Sharks. Game One is on Thursday. The story for the Sharks is simple enough: win the series. 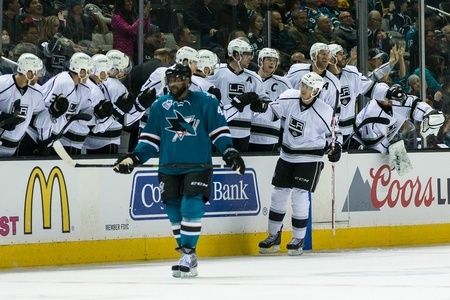 San Jose has been in tough against the Kings before and have seen early exits at the hands of their California rivals in 2013 and 2014. After not making the playoffs last season, the Sharks have to be hoping history doesn’t repeat itself. They have won four of five games against the Kings in the regular season, but the post-season is a different animal. Los Angeles will hope that head coach Darryl Sutter can once again work his magic and balance the lines. With new additions like Vincent Lecavalier to work with, the Kings have a lot of options and can throw a lot of different looks at the Sharks. That could spell trouble for the opposition, but Sutter’s club also has to regain its composure when it comes to closing games out. Jonathan Quick has been responsible for giving his team a chance to win every game and he’ll be tasked with more of the same against the Sharks. He went 40-23-5 in the regular season with a 2.22 goals against average and a .918 save percentage. He posted five shutouts and allowed one or fewer goals in his first 34 games. The Sharks will go with the dynamic duo of Martin Jones and James Reimer. Both goalies are relatively new to the party in San Jose, with Jones coming over from the Kings and Reimer an acquisition from Toronto. Jones saw 65 starts with the Kings this season and won 37 games, posting a 2.27 goals against average with a .918 save percentage. And Reimer’s won six games for the Sharks so far, which could put him in line for some post-season ice time. Brent Burns is coming off a career year with 75 points in 82 games, including 27 goals. The versatile blueliner is in the Norris Trophy conversation and has 30 points on the power play. He can propel the Sharks’ attack from his own end and likes to fire the puck. Pairing him with Paul Martin seems to have been the right move, too, while the pairing of Marc-Edouard Vlasic and Justin Braun gives San Jose a solid number two unit. Drew Doughty had another good year, putting up 51 points in 82 games. He’ll put up huge minutes in the post-season and makes an efficient pairing with Brayden McNabb. Jake Muzzin and Alec Martinez have found chemistry together in the second half of the season, although the former is questionable with an undisclosed injury. The good news is that Martinez has been skating with the Kings. The Kings have found a lot of punch from Anze Kopitar and Jeff Carter, with Kopitar once again leading the club in scoring and Carter overcoming injury to still reach the 20-goal mark. He forged a terrific line with Tyler Toffoli and Milan Lucic, with Toffoli locking in 31 goals and taking some of the pressure off Kopitar. Lucic, meanwhile, seems to be developing into the power forward Los Angeles wanted. He’ll get more time to test his mettle against the Sharks. San Jose once again has considerable depth in the forward group, with Joe Thornton and Joe Pavelski leading the charge. Thornton had a point a game in the regular season and tightened up his defensive game, while Pavelski seemed to hit an extra gear in his first season as team captain. He had 78 points, including 38 goals, and has fed Tomas Hertl some confidence. Despite missing a chunk of action, Logan Couture gave the Sharks options and he’ll be ready for more in the playoffs. The Sharks have more forward depth than the Kings and can roll more lines with greater consistency, plus they’re particularly dangerous on the power play. They can move the puck around well, with Burns and Thornton finding open spaces and setting up Pavelski in front of the goal. The Kings will have to clear their crease and play a physical game against their California rivals. That shouldn’t be a problem. This has the potential to be a big, bruising series, but Los Angeles will need to find more balance to get away with this one. Sutter’s game hits another level in the post-season, but these Sharks are dangerous on paper and may have the ability to overcome whatever’s been holding them back. The Kings will have to be sharp and they’ll need to get more out of depth players. Given the available data, I can see the San Jose Sharks finally getting over the hump with a win in seven games.